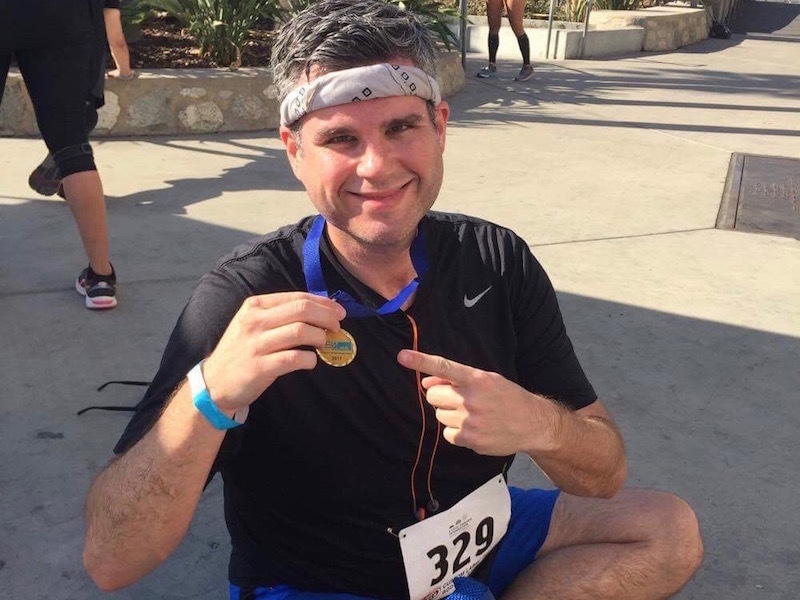 I Think I’m Gonna Barf (Los Angeles CF Climb 2017 Race Recap) | Keep It Up, David! This race has been on my calendar for a long time. 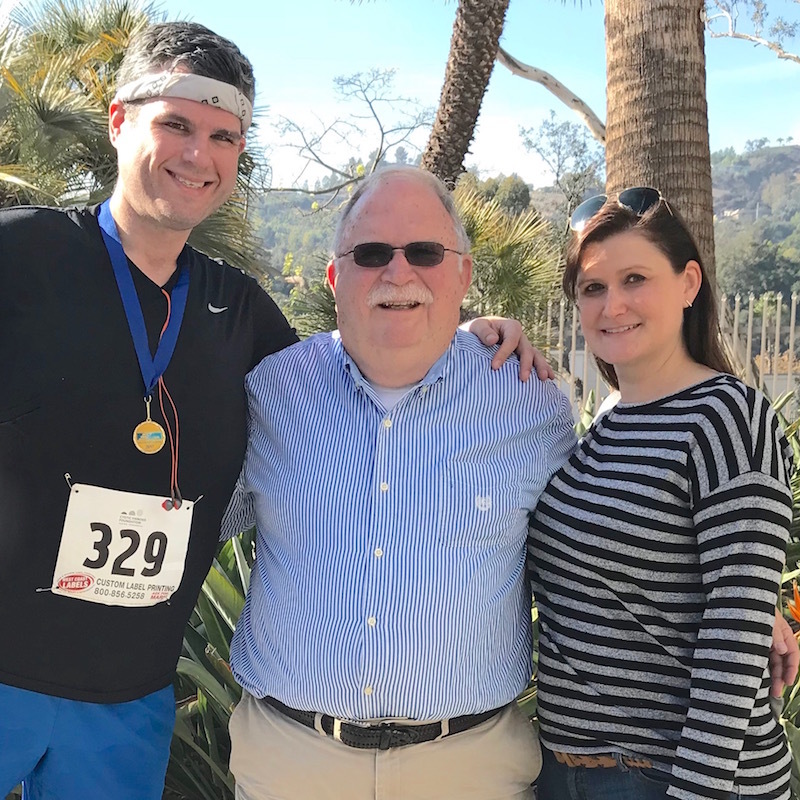 It was the Los Angeles CF Climb, organized by and benefiting the Cystic Fibrosis Foundation. I felt achy, sniffly and exhausted as soon as I woke up on Sunday, but I didn’t want to bail. I’ve only bailed on a stair race once, due to a foot injury, and that’s a pretty awesome record, seeing as how this was my 52nd stair race! I figured I could go, give it my best shot, and see what happened. It would be fun to see my friends that were going to be there. Plus, people had donated to the CFF on my behalf, and I didn’t want to let down my donors. One of my donors was even going to be there, cheering me on! 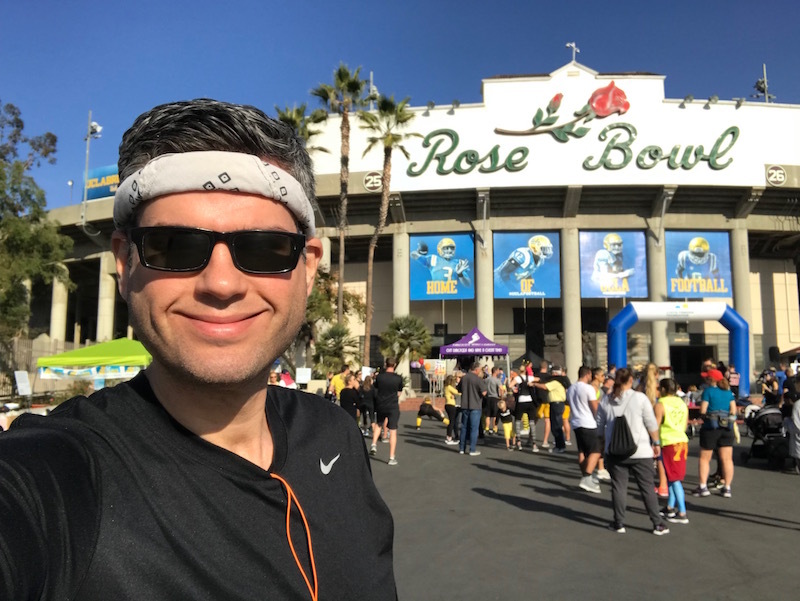 This was my fifth year doing this race, but it was the first time that it was being held at the iconic Rose Bowl. (Previous venues include the Coliseum and a 54-story skyscraper.) 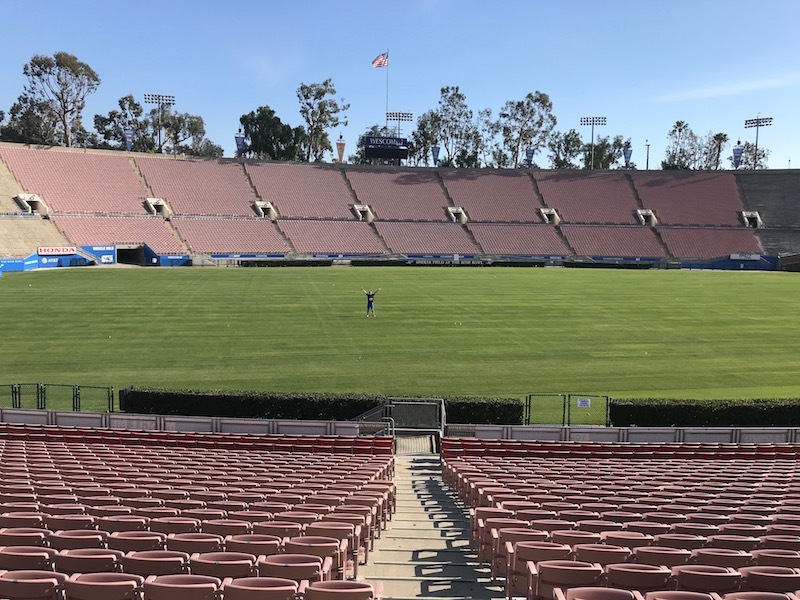 A few years ago I took a boot camp class that was held inside the Rose Bowl, but I’ve never raced up and down the aisles before… and there are a lot of aisles – this place seats over 90,000! My friend Paul owns the timing company that was hired for this race, and he’s the one that designed the route. He gave me a heads up regarding what to expect. Basically, participants had the choice to climb 1,000 steps, or they could sign up for the Extreme Climb – 3,300 steps. Do you even have to ask which one I signed up for? EXTREME! Extreme climbers went all the way to the top of each aisle, but everyone else only went up part way. I definitely still felt stuffed up and achy as I stretched before the race, but my adrenaline started pumping, and I was getting excited. 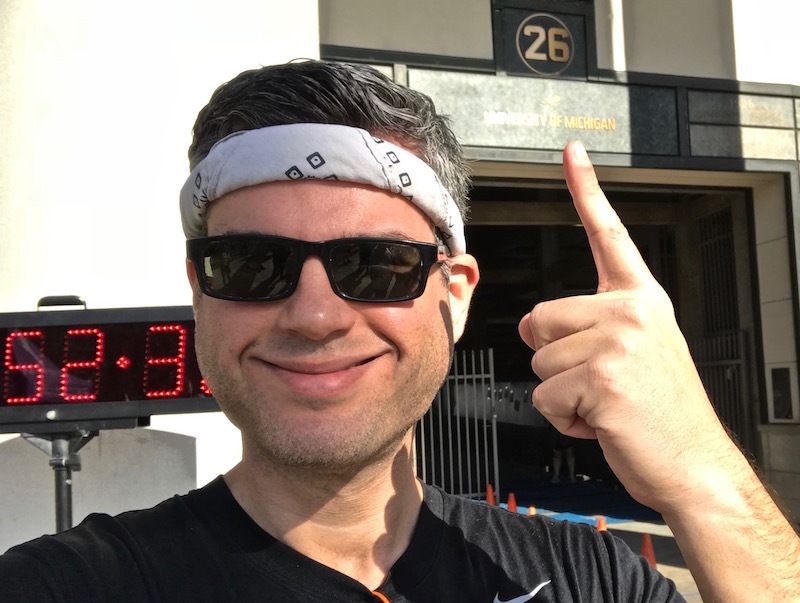 Plus, I took it as a good sign that the race began in Tunnel 26, which had been designated the University of Michigan tunnel. That’s my alma mater! Michigan deserves this recognition. They’ve competed in the Rose Bowl more times than any other Big 10 school – 20 appearances and 8 wins. I was there for one of those games, when I was 9 years old, in 1989, in this very stadium. I’m pointing at the University of Michigan sign, but the glare makes it hard to make out in the photo. 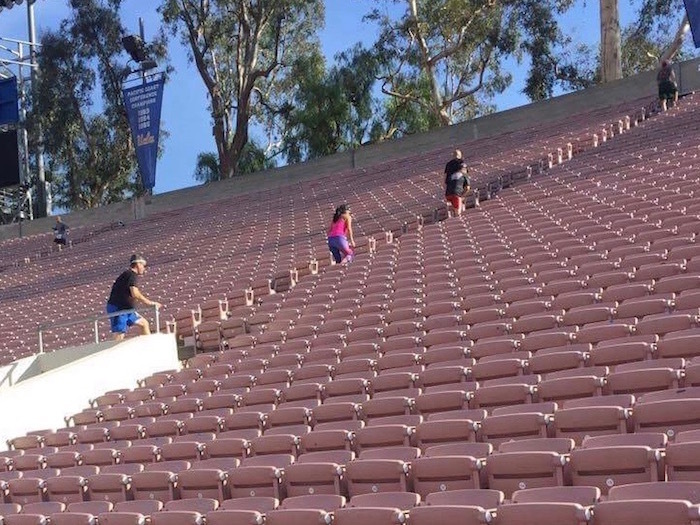 I learned very quickly when the race began that the Rose Bowl has all sorts of different kinds of steps. Some, down by the field, were very shallow, but near the top they got pretty steep. Some aisles had handrails, most didn’t. Some aisles were pretty consistent, others weren’t at all. My friend Robyn got a picture of me near the start of the race, in the lower left. It’s funny how as soon as the race started, I stopped thinking about my cold. I’m sure the congestion was making me breath harder, but stairs are pretty hard anyway. I moved along at a pretty consistent clip for the first half of the race. Shortly after the halfway mark, though, I got a very pointed reminder that I was actually under the weather: I threw up a little bit, in my mouth. YUCK. It was one of those pre-vomit internal warnings – some gurgles in my stomach that made their way up my throat. My body was very clearly telling me to stop doing what I was doing, or things could get very ugly, very messy, very smelly, and very soon. I didn’t stop, but I slowed down drastically. I looked around, and made sure no one was around me. For the next aisle or two, I pinpointed corners or areas where I could barf, if I needed to, that wouldn’t impede the other climbers. Luckily, I didn’t barf. And that gave me the resolve to finish the race, at a more subdued pace, except for the very last aisle, which I sprinted. I lied down for a spell after crossing the finish line. I was pooped, and while I no longer felt like barfing, I did feel like hibernating. 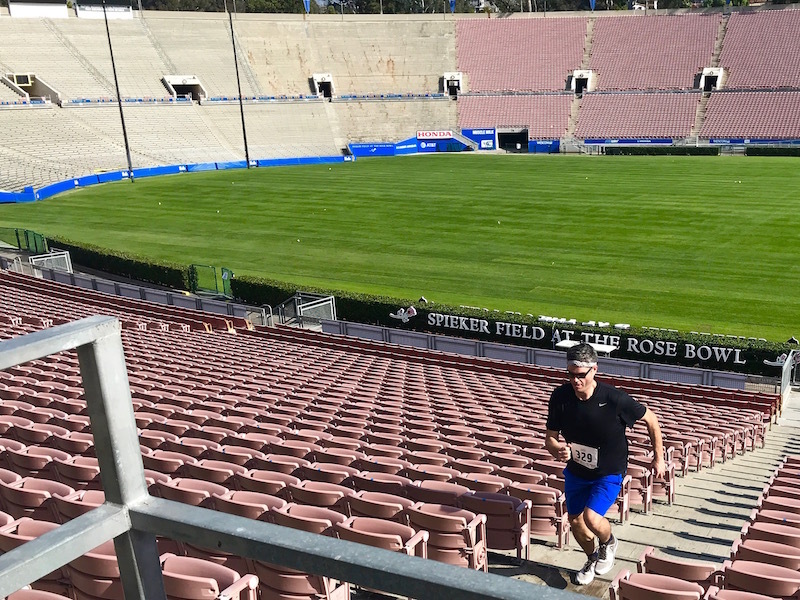 A little while after that, a few of us went back into the stadium, to cheer on our friend George, who was still on the course. 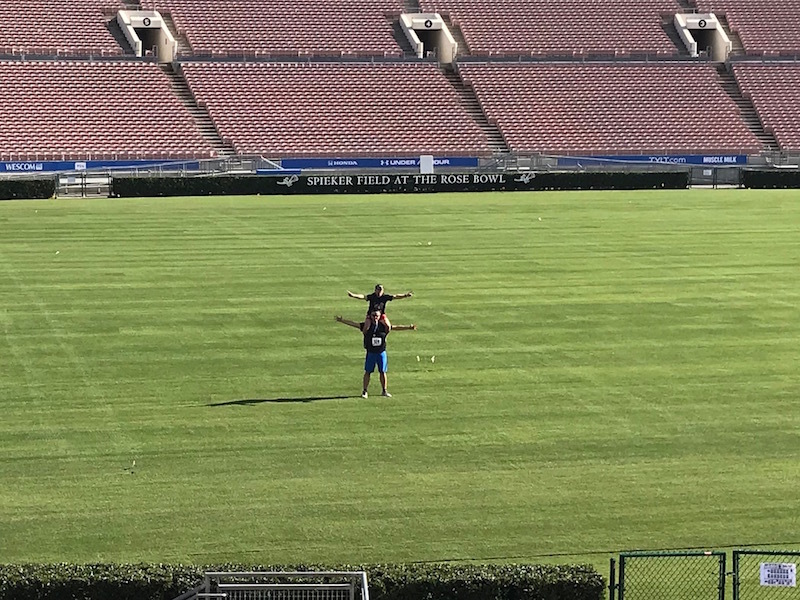 I also snuck onto the field, and had a moment to myself, at the center of one of the most famous athletic landmarks in the country. Then my friend Leland ran out and wanted to do a stunt – so I lifted him on my shoulders. 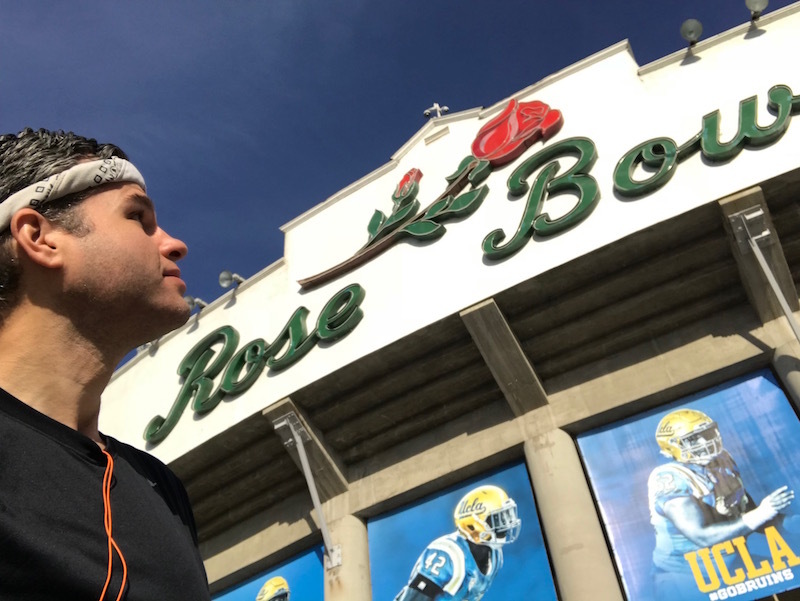 Hey, with that little stunt under my belt, I can say I performed at the Rose Bowl, just like U2, the Rolling Stones, and Beyonce! I got my time before leaving. 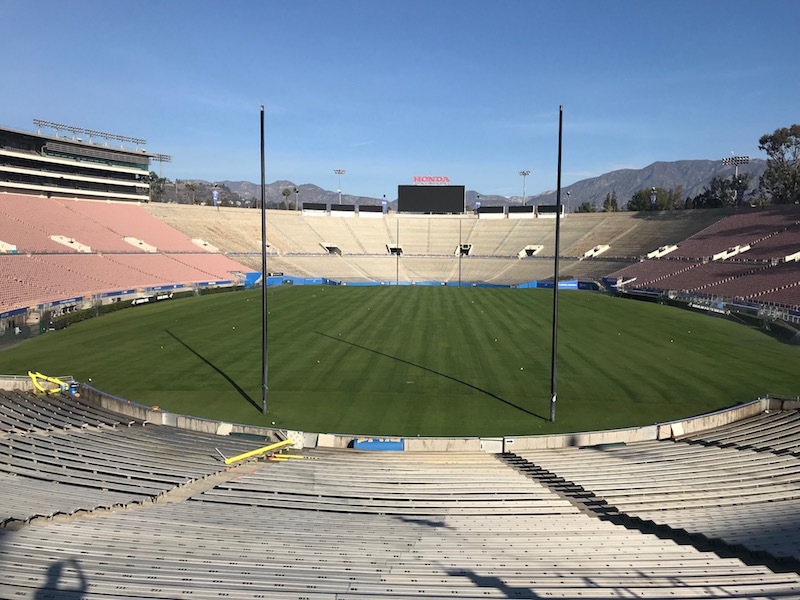 I ran the Rose Bowl aisles in 23 minutes, 42 seconds. Being timed was optional at this race, and only about 1/3rd of the participants opted in, so I don’t really know how I did compared to the whole group, but I don’t really care. Today was more about showing up and completing the task at hand, despite not feeling 100 percent. Plus, I’ve set a baseline for next year, and here’s hoping that at next year’s race, I’ll easily set a new PR! A quick follow-up: I went home after the race and slept the rest of the day and night. On Monday, I was feeling better. Not great, but better. That’s an improvement! Robyn and I have been friends for fifteen years. I first met Tim, Robyn’s dad, six years ago, and since then, he’s been a good friend and a frequent, and very generous, donor to my various stair races. He’s visiting from New Hampshire, and told me and Robyn months ago that he wanted to come check out this race. I wanted to publicly thank Tim for his donation, and thank Tim and Robyn for cheering me on. I’d also like to thank Mat and Dana, who also contributed to my fundraising for the Los Angeles CF Climb. I couldn’t have experiences like this one without help from my very generous donors, and I never, ever forget that. This entry was posted on Monday, December 4th, 2017 at 11:39 pm and is filed under Uncategorized. You can follow any responses to this entry through the RSS 2.0 feed. You can leave a response, or trackback from your own site.